the adventures of tartanscot™: "In the Bleak Midwinter . . . "
Frosty wind made moan . . . "
Water like a stone . . . "
"Snow had fallen snow on snow, . . . "
"Snow on snow . . . "
Beautiful post, and so appropriate given that we had our once a year snow here in Atlanta in recent days...I look outside and my back yard is draped in an unfamiliar cloak of white. That is my favorite Christmas-time carol... brought back wonderful memories from my choir days. Lovely post. It is so cold here! We aren't used to this weather in Memphis. I'm doing a week of white images in the next couple of weeks (whenever I can get it together). Some of my images are the same as yours. Stop by and check it out. Happy New Year to you. I hope you had a great holiday! That's my kind of "snow"... warm to the touch! Stunning. I too am looking out my window to a snow covered landscape and a deep foggy mist. 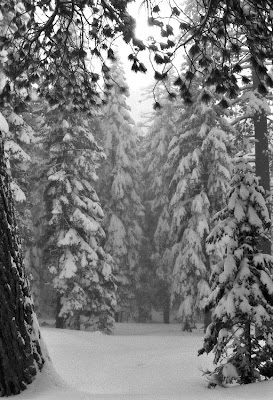 Not many things in life are more beautiful than Tahoe under snow...but today your posting is! While all this white outside is not so appealing, all this white inside is lovely. I just read on Twitter that it's snowing in Florida. Timely post. I am feeling the cold this year in SF for the first time in six years of living here. Your images are gorgeous but I especially love the Yosemite shot. London has been having the coldest temps since the 1960s, it's snowing in Florida. I hope everyone is snuggled and warm too, beautiful post, Kathy. What soothing elegant rooms in the color of snow. Wonderful post! Beautiful posting, Scot. Also makes me glad we live in SF! I've forgotten warmth. We're in a deep freeze! Thanks for the lovely post. This was a Fabulous Post. Such a lovely lovely collection. I am super snuggled and warm in the cold Canadian winter -- it was about -17C at my weekend place today (that's about 0F) but the sun was glorious, the lake is frozen with kids playing hockey and I met many people out for walks bundled up, saying hi and remarking about what a lovely day. That's how you keep your sanity this time of year here! Well, that and curling up with a gorgeous blog post like this. That last room is just exquisite! Snuggled and warm but nothing white outside. Rain rain rain. Beautiful pictures. 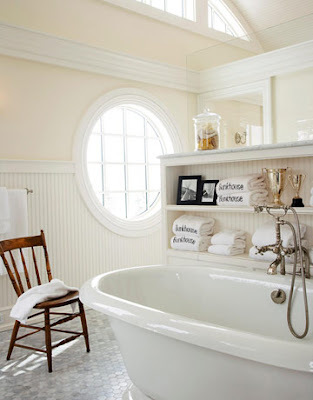 I love the bathroom with the round window and the white on white walls. I can never maintain a white on white decor-colour always sneaks in. Now I decorate in warm colours and a little white sneaks in. Love the Rossetti! I was singing it line by line as I read! The Yosemite photograph was breathtaking! Hope you are snuggled up nice and warm! 25 here in baltimore as i write! have you heard james taylor's version of this song? it's gorgeous! We are a balmy 19 at the moment here in Utah. I think our day will climb to 32. We have been covered in snow since early December. It's a great time to stay inside and yet visit friends all around the world- like you! Thanks for the visit and the beautiful poem set so nicely to pictures. That's white is such a stunner! Love it all. Actually Scot, I was in Atlanta this weekend freezing to death trying to think of beautiful spring flowers. I loved your post! Lovely post...I particularly like the Yosemite image. White is always fresh. Beautiful decor as well. I was "iced" in on Friday here in Atlanta, snow still on the deck. Who would have thought? Beautiful all the same. I love the rooms you posted. They are so beautiful. That white color is so pretty - very much like the color in our bedroom. I think that color is so calming. Thank you so much.